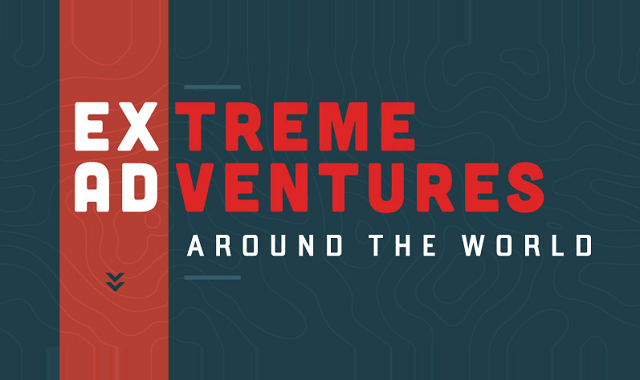 The World’s Most Extreme Adventures - How Extreme Are You? #infographic ~ Visualistan '+g+"
A new infographic from TravelSupermarket has researched the world’s most extreme adventures. So why not find out just how far you’d go to get your kicks. These days the meaning of extreme has changed. It’s not enough to just throw yourself out of a plane with only a thin nylon parachute for company, paraglide or run a marathon. In order to be truly extreme, you have to do it higher, bigger and faster than everyone else. To discover just what the word ‘extreme’ really means, TravelSupermarket has scoured the world looking for the most extreme adventures. And they’ve put them all together in one handy infographic. So, if you feel like taking on a new challenge that’s really going to get your pulse racing, then this is what you’ve been waiting for. The infographic details exactly what the extreme adventure entails, where you can do it, what it costs and what you need to know. And sometimes it’s pretty unbelievable stuff. The world’s fastest zip line – imagine flying over the Welsh countryside at 100 mph. Rope swings with a difference – ever fancied swinging 95 metres through the air 120 metres from the rocky bottom. Volcano boarding – hurtle down the side of an active volcano in Central America. As well as the above, you can also find out more about cycling Bolivia’s infamous Road of Death, the 254km Marathon des Sables and the world’s highest bungee jump – 233 metres in case you are wondering. So, if you fancy lake bombing, cliff camping and generally taking on the most challenging activities in the world – then this is the list for you. Why settle for every day, run-of-the-mill adventures, when you can go extreme?